So, I said my weld is bolting. 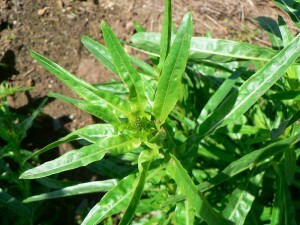 The term “bolting” is usually used about edible plants when they go to seed and therefore are no longer edible, like lettuce or spinach or radishes. That’s not exactly my problem, since the plants are still perfectly useful. The only reason I am bothered by this activity is that I do not think the weld plants will get as tall in their first year as they would if they waited until next year. 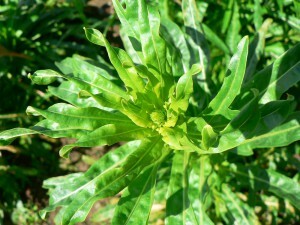 Second year weld plants can reach five feet or more. 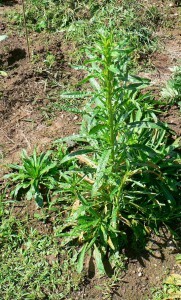 These plants are about 3 feet tall, though they may get taller before summer is over. I had been anticipating a lot more plant material, not this year but *next* summer. Ah, well. On the other hand, another surprising thing has happened in the bed. When I planted back in the spring, I put in a lot of seeds but only a few germinated. I often think of weld as fussy and a little hard to grow, though I have read that in some places in Europe and the Middle East it has naturalized and grows weedily. I tend to have poor germination, so I figured a few plants from a lot of seeds was normal. They had germinated in little clusters, so I transplanted and spread out the seedlings so they’d have more room. 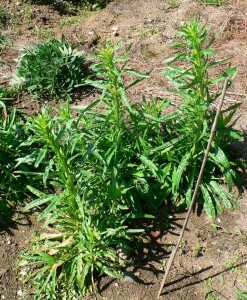 Well, just a few weeks ago I noticed that several more weld plants had sprouted up, and they are now respectably big. So overall I have more plants than I anticipated. I’m not sure if all this means that the weld is happy and content or that it’s sad and stressed out. We have had a blissful summer weather-wise, from my point of view, so I assume the plants are happy. I plan to harvest the tall ones later this summer or early fall, and leave the rest to grow next summer. Hans, the farmer who tends “Mr. McGregor’s Garden” at Bramble Hill (where my plot is located), said the plants that are bolting this year might grow again next year. I may leave the roots in the ground and see if they do.